ClickIt is an application that is compatible with the most popular web browsers, including Google Chrome, Internet Explorer, and Mozilla Firefox. It is unlikely that the suspicious app will be installed onto any PC without the permission of the owner; however, most users acquire this browser extension by accident or without fully understanding how the program works. Overall, it is likely that most users will choose to remove ClickIt after learning more about it. Continue reading to find out why you should delete this app as well. SaveNShop, SharkManCoupon, and SaveON are just a few of the many clones that ClickIt has. Despite the different names, all of these programs have been created to work in the same manner. First of all, none of the applications built using the Justplugit engine are officially presented. If you are not familiar with the developer of a program and you do not know how it works, you must delete it without any hesitation, because this type of a program is unpredictable. Secondly, ClickIt is an advertisement-supported program, and if you do not remove it, sooner or later you will be flooded with potentially unreliable advertisements. Even though it is risky to have ClickIt running on your operating system, because it can communicate with unknown adware servers and display ads linked to unknown advertisers, this is not a program that you need to fear the most. It is crucial to delete ClickIt to guarantee that all of the security issues related to the unpredictable ads are resolved. However, it may be even more crucial to remove the software installed together with this advertisement-supported program. 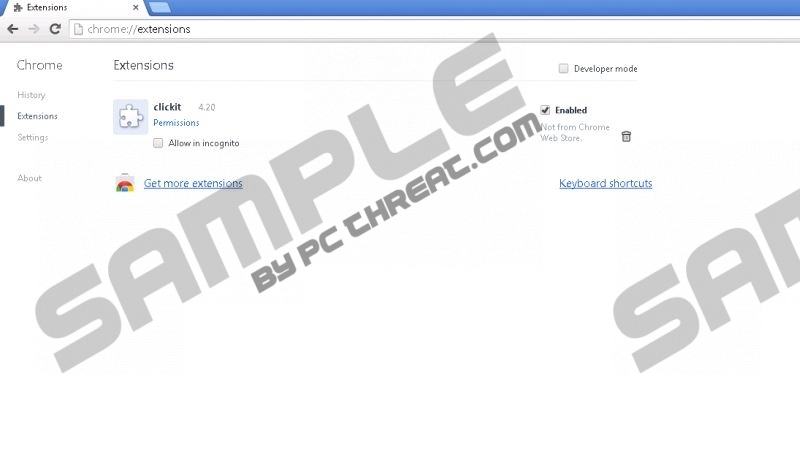 ClickIt may be spread by such third-party installers as Installrex, Amonetize, and Vittalia. These installers have been used in the past for the distribution of the ClickIt’s clones which users need to remove as well. These installers package adware together with PUPs (potentially undesirable programs) and more dangerous threats like intrusive tracking cookies or even Trojans. Needless to say, this is why we also recommend removing ClickIt-related software. Do not allow ClickIt to run on your operating system. It is an unreliable browser extension which you need to delete from your browsers as soon as possible. The manual removal instructions displayed below may be helpful if your operating system is only affected by undesirable programs and adware. Unfortunately, even if you perform the operation successfully, it is likely that you will need to delete ClickIt leftovers. If you face leftovers or more stubborn malware that you cannot delete yourself, you should install automatic malware removal software ASAP. Navigate to the left of the Task Bar and click the Start button. In the Change or Remove Programs menu select and Remove the unwanted application. Move to Programs and click Uninstall a program (you can also use the search box to find the utility). Right-click the application you wish to delete from your PC and select Uninstall. Quick & tested solution for ClickIt removal.